Tiyanna Scott is an emerging visual artist living in North Philadelphia. Tiyanna Scott is an 18 year old artist born in Georgia and raised in Delaware, USA. Being the youngest of three girls raised by a single mother (Stephanie Roach) she picked up on things to occupy her. She began singing, drawing, playing sports, cooking — anything to keep busy. As she grew she lost passion for sports and it increased in other areas. She would often get in trouble for doodling on things “not meant for ink” which was basically anything she could get her hands on. Although Tiyana was described as a “troubled child” she was very misunderstood. “You’re smart, why must you act this way?”, her teachers and administrators would tell her. Being the fact that she was said to have an attitude problem, she was doubted. Nobody thought she would graduate with her class so she finished two months earlier than her classmates. Tiyanna graduated from Dover High School in Dover, Delaware at the age of 17. 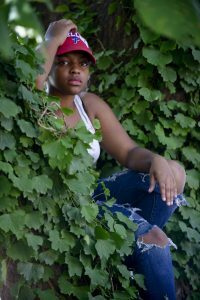 Not many days after graduating Tiyanna set off on her own, moving to Philadelphia with her best friend Tamia Garcia to further her experience in life and open opportunities. One day Tiyanna and Tamia were walking through Meditation Park on North Alder Street, saw Ile Ife Open Mic Night and decided to join the party. They liked what they had participated in so they followed up with Kwasi Ohene-Ayeh, the artist in residence at the Village of Arts and Humanities, and began helping with the events. Soon after, they became members of the “Supa Future Studio” Collective. Tiyanna is currently managing open mic events, creating things from scraps, working on her music and painting on things “not meant for ink”.